Hallaton Environmental Linings has been awarded with IAGI’s (International Association of Geosynthetic Installers) Award of Excellence at Geosynthetics Conference 2019 in Houston, TX, for the Druid Hill Reservoir Temporary Lined Cofferdam project located in Baltimore, Maryland. Hallaton performed the geosynthetics installation portion of a temporary stone cofferdam at the Druid Hill Reservoir. Hallaton’s crew installed an XR-3 Potable Water Grade Geomembrane on one side of a stone cofferdam inside of a 55-acre active drinking water reservoir. The lined cofferdam was a critical component of an overall $164-million-dollar, 5-year project to upgrade the drinking water system which provides Baltimore area citizens with safe drinking water. Read more about the Druid Hill Reservoir Temporary Lined Cofferdam project. While you’re at Geosynthetics Conference 2019, stop by Booth 217 to learn more about this award-winning project and for any geosynthetic installation needs you may have. This entry was posted in Awards, Conferences, Hallaton News on February 13, 2019 by halladmin. Hallaton Environmental Linings’ team competed in the GEOGames at Geosynthetics Conference 2019 in Houston, TX, on Tuesday evening, February 12, 2019. The GEOGames were hosted by IAGI and sponsored by AGRU America. This entry was posted in Conferences, Hallaton News on February 13, 2019 by halladmin. 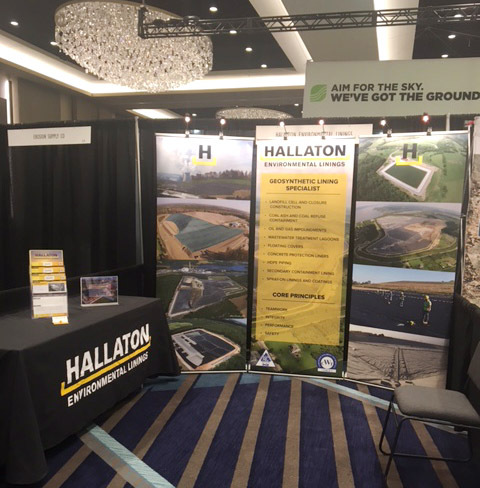 Hallaton is delighted to be exhibiting at Geosynthetics Conference 2019, the largest geosynthetics trade event in North America. This highly respected conference, which is being held February 10–13 in Houston, Texas, features more than 1,300 geotechnical practitioners, designers, regulators, contractors, and installers. In addition to the educational plenary sessions and technical workshops, this trade show event also offers a robust show floor where you can you can see the latest developments in geotechnical products and services. The conference provides excellent opportunities to network and socialize, so please visit us at Booth 217. You’ll get to view innovative footage of our recent projects and can discuss your project needs with our sales & project management team. We invite you to enjoy this must-attend trade show event as our valued guest. Apply these discount codes at registration checkout for free trade show only registration or 10% off full registration. We look forward to meeting you at Geosynthetics Conference 2019! Stop by and visit us at Booth 217. 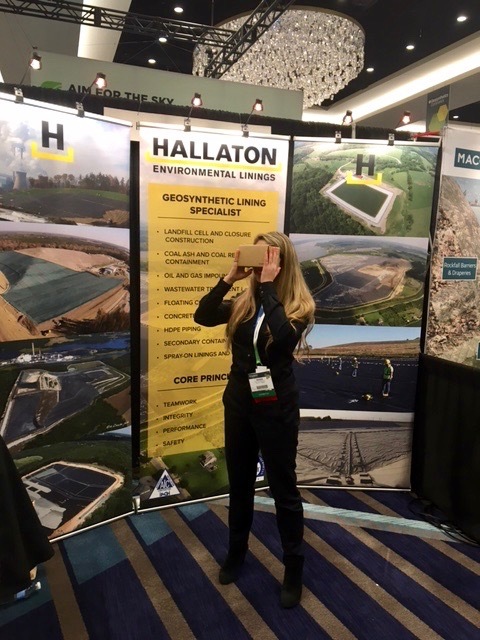 A booth visitor experiences a 360 video of one of our projects. Hallaton Environmental Linings is an industry-leading environmental construction geosynthetics installer. With more than 25 years in the industry, Hallaton has earned its reputation as one of the most experienced and respected geosynthetic installation companies in the country. Hallaton has installed over 650 million square feet of geosynthetics and is an IAGI-approved installation contractor (AIC). We specialize in the supply and installation of geosynthetics, HDPE piping systems, floating covers, rain covers, secondary containment, manhole & pipe restoration, and polyurea coatings. We provide construction services on projects varying in size and scale for both the municipal and private sectors, including the solid waste, mining, power generation, oil & gas, chemical, and utilities industries. Hallaton has an exemplary safety record. We are committed to partnering with customers to deliver high quality projects that are completed safely, on time, and within budget. This entry was posted in Conferences on February 5, 2019 by halladmin. When we learned that the GeoGames were debuting at Geosynthetics Conference 2019, we eagerly applied for the exciting challenge. Hosted by the International Association of Geosynthetics Installers (IAGI) and sponsored by AGRU America, this outdoor event will feature welding competitions by teams of installers. The GeoGames are a fun way to highlight the technical work of geosynthetics installers. The teams of certified welding technicians will compete to weld various geomembranes in different configurations (such as pipe boots and challenging angles) while still maintaining high quality work. Each team will be asked to extrusion weld and wedge weld, and judges will award points for both quality and speed of installation. If you’re attending Geosynthetics Conference 2019, come on over to Discovery Green Park (across the street from Marriott Marquis Houston) on Tuesday, Feb 12, 5–7 pm and cheer us on. We’re hoping to bring home the trophy! This entry was posted in Conferences on February 4, 2019 by halladmin.